This article was written by our Cordence member Maki Kazutoshi, Founder of Genex Partners Japan. Industry 4.0 has been a hot topic in Japan since the beginning of 2015. Despite the interest, there have been few examples of direction and success shared around the topic. Some critics say Industry 4.0 is a buzz word or no different from traditional factory automation (FA) so no action is necessary. However, the recent spread of the internet and the development speed of information technology has not only created more convenient and better business but is surely about to change the traditional manufacturing business model. 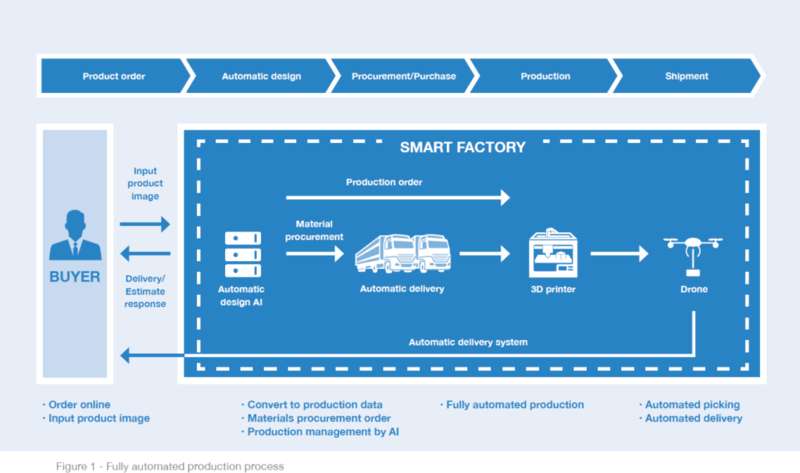 Change in the style of manufacturing led by “smart factory” implies that there is a shift in values from industrial goods to more design and application development focused “innovation.” The purpose of smart factory is to expand the imagination and creativity of humans with the power of artificial intelligence (AI) and virtual reality (VR), and not just to optimize quality, cost, and delivery (QCD). On the other hand, some say the rapid rise of robots and AI are threats to humanity. Issues have also been arising around safety and ethics. It is awkward to see machines coordinating with each other to make autonomous decisions when they were merely obedient tools for people, and we may eventually have to work with virtual personalities we have created. This is not a nightmare if we can build an adequate partnership with machines as we communicate with each other to overcome problems and find solutions. We can work together with machines to solve complicated social and global issues such as decreasing birthrate, aging population, and sustaining the global environment. We need to have reasons to utilize technology development for our own happiness. Perhaps the biggest impact Industy 4.0 has on our lives is the realization of “smart factory”. Smart factory is a fully automated factory, where machines and robots, linked together by cyber-physical systems (CPS), work in collaboration through their own decision-making. Full automation implies “unmanned” production formation, where the whole manufacturing process, from raw materials procurement to shipping, is fully automated digitally and mechanically (Figure 1). The intention with FA has always been to introduce robots and computer control systems in production lines to run every day of the year without interruption of the operations, but human intervention has been necessary for production planning and making adjustments in response to urgent requests. Machines were never capable of handling operations other than that which humans programmed them to do. Industry 4.0 takes manufacturing beyond production in factories to surrounding operations such as sales, logistics, and maintenance, and requires large scale transformation of operations in services as well. This will free manufacturing workers from headaches and burdensome operational tasks, such as optimization of product inventory and delivery adjustment. On the other hand, there is also a negative impact on people losing jobs to machines. For example, cashiers at supermarkets are typically part-time workers. These jobs will be replaced by self-checkout systems and will bring clear financial savings to companies by reducing large labor costs. There are approximately 4 million jobs for cashiers in the US, which may disappear with the spread of selfcheckout systems. There need to be positive motives for people to use machines in order to eradicate the unarticulated sense of danger around Industry 4.0. In Japan, some believe that one of the largest benefits of AI is the automatic language translation to English functionality, currently regarded as one of the challenges in international relations for Japanese. The Japanese, who are known for their talents in manufacturing, should come up with an idea to utilize advanced technology to make manufacturing more fun, thus attracting more people into the manufacturing industry. For example, a design environment to simulate any object into a 3D hologram, robots capable of giving operational instructions at manufacturing sites, and wearable devices to assist inexperienced operators perform operations. There are so many possibilities if we are prepared to picture exciting work environments, equipment to support amateurs, and easy-to-operate factory facilities for managers. There is also a value in enhancing the safety and reliability of operations with enhanced digital functionalities to support workers at manufacturing sites. Such workers would be difficult to replace due to low birth rates, aging populations, and accelerating globalization. We must always think about “how robots can be utilized so that people can focus on high value-added operations” and not “how we can improve safety and reliability of operations by replacing people with robots.” As we welcome robots to make our lives easier, we must continue to work on enhancing morals and making good decisions to give the right motives for workers and educators. No one will want to use robots if they believe robots take away their jobs. It will be a business advantage if digitization is regarded as creating options for operational processes to respond to various needs of workers and customers, rather than simply implementing new technology to replace workers and operations in the interest of capitalists and management alone. Let’s look at what AI and robots can do better than people, and how they can compensate for our weaknesses and limitations. People can only process a limited number of operations on their own, have a limited activity range, and can only move things and information at a limited speed. People cannot function without taking periodic breaks and will deteriorate with age. When a person is “damaged” from injury or sickness, replacing parts do not fix them. On their own, people cannot sense or influence what happens in a situation which is not within reach or within their range of vision. If autonomous machines connected to networks can compensate for our limitations, there is no reason why we shouldn’t proactively utilize them. The reality is that we are benefiting from AI and robots on a larger scale than we realize. As sensors and AI, which are equivalent to our sensory organs and brain, become more advanced, anyone has a chance to acquire abilities that were not previously available to them. Combining with internet remote control, it is no longer difficult to accurately control robots in a remote location. For instance, robots equipped with ultra-sensitive sensors can differentiate target objects differently from humans by detecting lights, sounds, smells, and temperature changes which are undetectable to humans. This is how AI differentiates target objects and distinguishes itself from human capability. 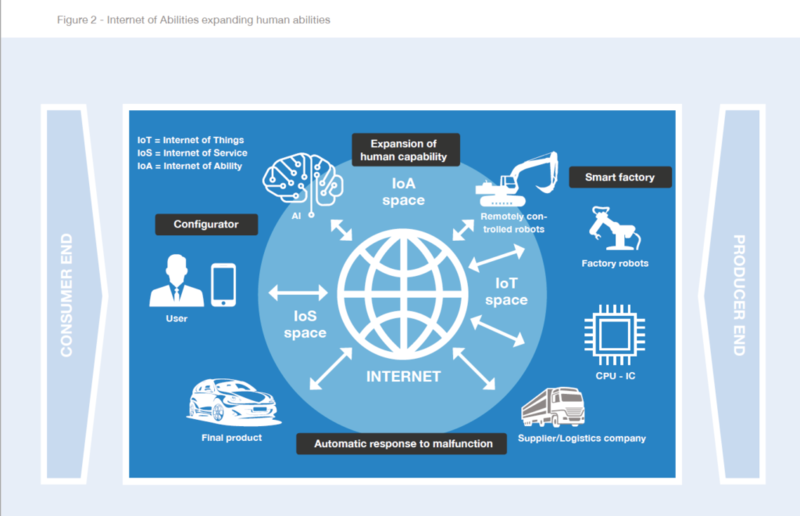 This is an illustration of how IoA (Internet of Abilities) is underway to expand human abilities beyond the limitation of time and space (Figure 2). Building smart factories requires a large amount of investment in information technology and factory equipment. Although it may seem attractive for advanced countries with scarce labor forces, it is an enormous, non-essential, and non-urgent investment for emerging countries with an abundance of labor forces. Germany, the instigator of Industry 4.0, has focused on investigating how technological advancement can co-exist with humans and avoid steering companies towards blind automation and causing sudden increases in unemployment. How workers see the convenience of automation is not the same as how capitalists and corporate managers value automation. If large manufacturers lead automation purely for efficiency, leaving space for manual intervention will be considered a source of defect and inefficiency. Even if mechanical equipment may be able to accurately replicate the know-how of veteran engineers, it would still be unable to create an algorithm that would allow it to learn and replicate this know-how on its own. This is because human innovation is not the result of repetitive operations, it’s the result of a combination and accumulation of various experiences from working on other operations in daily life. Besides, the management of new functions and new process designs cannot be left to machines alone as they require sophisticated judgment linked to business performance and business values. Making adaptive and innovative process judgments are, and always will be, an important human value. We should continue to make every effort to create innovative jobs. If simple jobs are eventually going to be replaced by machines, it is essential that we focus on developing more innovative jobs such as product design and elemental technology development. On top of this, there is plenty of capacity for craftsmanship, which cannot be replicated by even the highest performing AI or robots. Therefore, there should also be value placed on promoting craftsmanship. Our ultimate goal is to demonstrate imagination and innovation to build a fair partnership between humans and machines. Click below to download the PDF version of “Industry 4.0: Bringing the human-machine relationship to the next level”. Source: Martin Ford. 2009. The Lights in the Tunnel: Automation, Accelerating Technology and the Economy of the Future. Createspace Independent Publishing Platform.